At the end of this week, I’ll be moving out of my apartment. Yep, the one I pretty much just moved into…7 months ago! I can’t believe it’s already that time again. Before you know it, I’ll be blogging from Florida! In an effort to use up some of the random foods I have in my pantry and refrigerator, I decided to make a meal that will (hopefully) carry me through the week in terms of dinner. I have a lot going on this week, so I wanted to be proactive and make a big pot of something. …in other words, Thai inspired comfort food. This dish took no time to throw together. And most importantly, it’s flavorful, a little spicy, and filling. Mmm mmm good! I know what you’re thinking…that simple? Yes, it really is that simple! And I’m actually looking forward to eating leftovers almost every night this week. Are you a fan of Thai food? What’s your favorite dish? I love how easy soups are. Thai food is comfort for me as well. Goo luck with the move!!!! I guess you’re right, this does look like soup! It works well over some quinoa as well. Good call on planning ahead. I love Thai food! More than curries, I love pad thai- so delicious and easy to whip up at home! 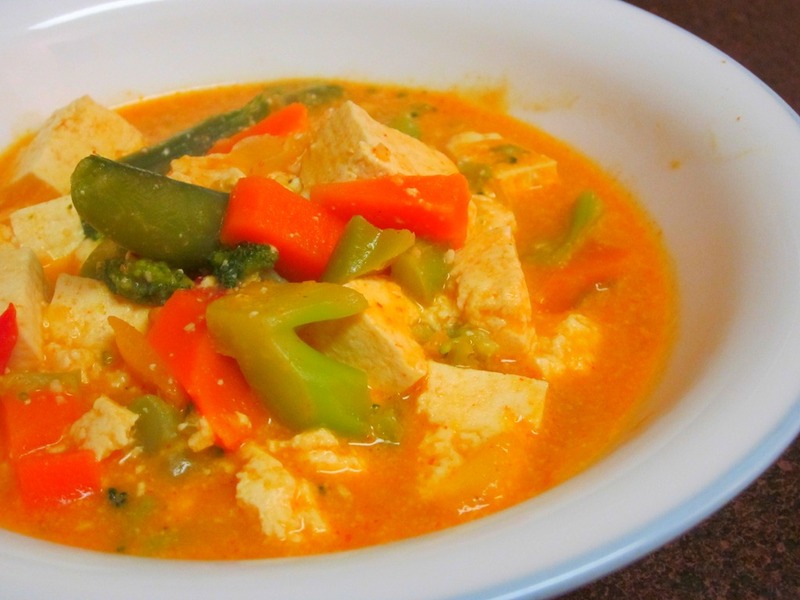 Do you have any recommendations for tasty red curry pastes? I’ve only used the Thai Kitchen one, but it’s pretty good and can be found in regular grocery stores. If you like things extra spicy, you would definitely want to add some extra ground red pepper. Oooh…I LOVE Pad Thai! When it’s made to my liking, it’s one of my favorite dishes! I make a soup like this but not with ginger! ahhh genius! i’ll be adding that fo-sho! <3 GORGEOUS PHOTOS darling! ooh! my fam is in tampa btw! so bloggy meet up this spring when I come to visit? =) mwah! YES! Please come visit so we can meet up. Let me know when!!! Yum, looks awesome! I love pad see ew and pad thai! I need to try pad see ew. I’ve heard it’s pretty good. Hi Parita!! Omgness this looks delicious!!! wowww it’s really ironic how much our lives have in common….! 😀 I just moved (still with my parents) to an apartment last week. But I’m getting married on March, and so within basically 5 months, I’ll be moving again! haha it’s just too cool that you’re in a similar situation. Hope you have a beauuuutiful day! Hi Ellie! Thank you! Yes, moving has been a constant part of my life over the past couple of years. I’m really looking forward to this next one though! LOOOOOVE Thai food!!! – one of my faves up there with Vietnamese food 🙂 I have to have Pad Thai if I’m eating Thai. Actually made a really good Thai chicken stir-fry on the weekend – you could def substitute tofu or prawns if you like. This looks yum and easy to make after work! Thanks for the recipe! Stir-frys are great easy and delicious go to recipes. Love em’! I love Thai food…something about the coconut that they put in there that hits the spot every time. And I don’t usually like coconut! You really can’t have good Thai meal without eating coconut in some form or fashion…I’m totally with you!